Ada pertanyaan untuk Kodakkodak Guesthouse? 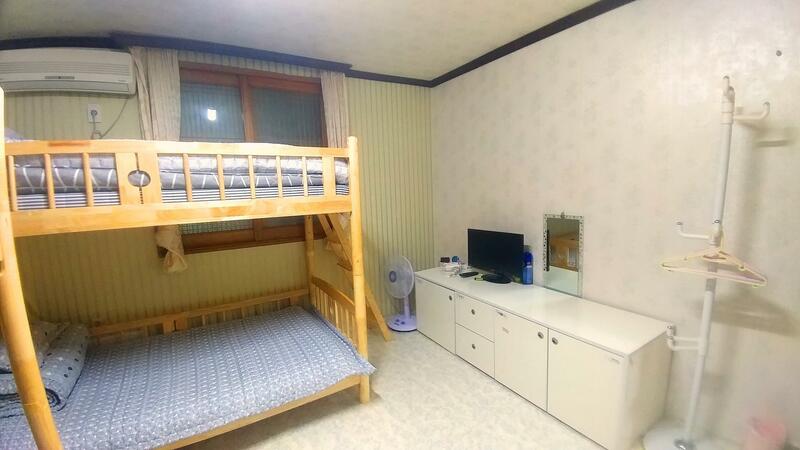 Terletak strategis di Pulau Jeju, Kodakkodak Guesthouse adalah tempat yang luar biasa untuk menelusuri kota yang aktif ini. Hanya dari sini, hotel bintang 1.5 ini dapat secara mudah diakses dari bandara. Dengan lokasinya yang strategis, hotel ini menawarkan akses mudah ke destinasi yang wajib dikunjungi di kota ini. Kodakkodak Guesthouse menawarkan pelayanan sempurna dan segala fasilitas penting untuk memanjakan para wisatawan. Hotel ini menyediakan WiFi gratis di semua kamar, check-in/check-out cepat, Wi-fi di tempat umum, tur, layanan binatu (laundry) untuk menjamin kenyamanan terbaik bagi para tamu kami. Semua akomodasi tamu dilengkapi dengan fasilitas yang telah dirancang dengan baik demi menjaga kenyamanan. Disamping itu, hotel memiliki berbagai pilihan fasilitas rekreasi yang menjamin Anda melakukan bermacam hal selama menginap. Kodakkodak Guesthouse adalah destinasi serbaguna bagi Anda sebagai akomodasi hotel yang berkualitas di Pulau Jeju. Biaya tambahan sebesar KRW 100,000 wajib dibayarkan secara tunai pada saat check-in sebagai uang jaminan untuk kerusakan atau biaya lainnya selama Anda menginap dan akan dikembalikan pada saat check-out. This place very near from Bus Stop and near from halal/muslim friendly restaurant. The Staff is very neat and help us. I will stay in here if I go to Jeju again. We stay here for 2 nights and so far for the room it’s a bit crowded for four pax’s but it’s worth of money. The only thing that I want to highlight here is the Manager, Luna was the nicest person I’ve ever met. She not only help us with our problem that we face which is our tyre got punctured, she make a call and try to find someone to help us with our car. We owed her life! Highly recommended this place for a backpackers. Thanks again Luna for your helps! The young lady manning the reception was very helpful in giving information about how to get buses and scheduling. The establishment was quite sufficient for our needs and it was very near the bus stop and the roundabout where you can get buses. The location of this guesthouse is majestic. Near several 24h convenient stores, restaurants, bus stops and it located on center of the city. The hostel has a laundry room that allows guests to use the washing machine for free. Guests can cook in the kitchen that was rather poorly maintained. Mattress is a bit hard and the only blanket is a nylon one that is not soft to the touch at all. No complaint considering the very reasonably priced room rate. The bus stop to/from the airport is very near to this hotel (Jungang Rotary Terminal, bus 181). Near to the 24 hours convenient store, bus stop, restaurant. In Jeju Island, the main mode of transportation is the bus. Not very far from local daily market (Seogwipo Maeil Olle Market). 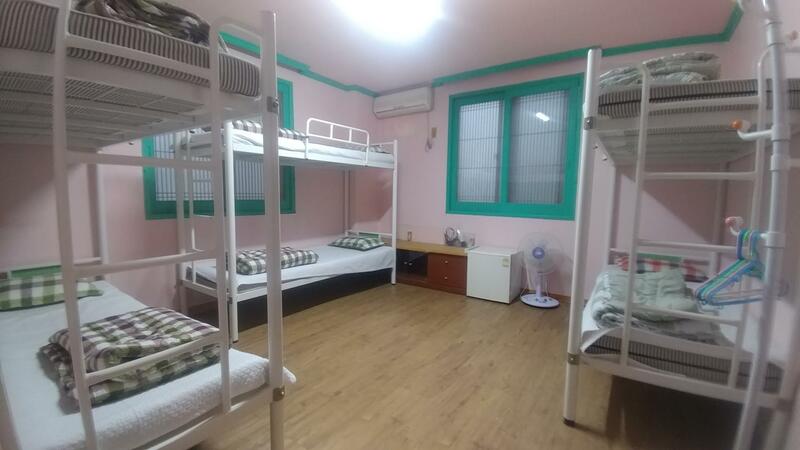 Each dorm has bathroom/toilet inside the dorm. Very convenient. No elevator, only stairs. They have kitchen with refrigerator. Free breakfast (toast bread & instant coffee). 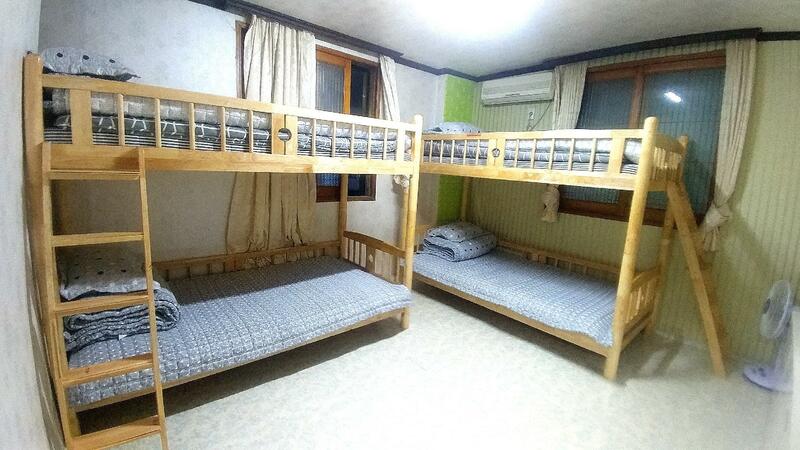 The dorm is very big for 6 person. They don't have locker/luggage storage. The bed is comfortable. Love this place. It's located inside Arang Jeoul Food Street No. 1. Also near Seogwipo Old Bus Terminal, Seogwipo Maeil Olle Market, Olle Tourist Office, Olle Route 6 & 7. Easily accessible to buses. Hostel owner is helpful. Kitchen is small but well-equipped. Hostel has international feel to it. Malays, Indians, Chinese, Europeans, Australians guests. Near convenient store, innisfree, very clean hostel with great surrounding. If you rent a car, they provide you a free parking space. located at the back alley but not too far from the main road and has very limited parking space. but there are 2 public parking nearby. the staff is super helpful. Seogwipo, although an hour away from the airport, is where most of the attractions are. Hence, Kodakkodak Guest house provides good starting location point. The guesthouse provides free breakfast (bread, jam and coffee) plus two crate-full of Jeju tangerine await the guests. Help yourself!! You can cook your own meal if you feel like buying seafood from the nearby 5 day Seogwipo market. Laundry is self service as well. Rooms are big and comfortable. Toiletries are complete and bath tub is a bonus! Really comfy! at first i was kinda worried as there are quite a number of bad review. Luckily i have good experience there. The room is clean and is quite easy for me to find the guesthouse. We actually rent a car and is convenient for me as im driving instead of using public transport. The host was very nice. Just ask him what u want and where u wanna go. he will answer and help you. Would definitely recommend to my friends that going to jeju! Oh ya, there are lots of restaurant nearby. The host was really kind, he helped us most of the time finding bus lines to the tourist places. The guesthouse is quite old, but it's value for money, and comfortable as well. It located right at the street food, very easy to find a good restaurant here. Drove a long way from airport in heavy rain only to discover this lovely place , strategically located in the town. Definitely value for money for my entire stay in Jeju. Lots of tourism materials available over the lobby. The only drawback being it has got limited parking space if you re with a car. It is located near shopping n eatery. The bus stop for airport bus is far though. So I hv to drag my heavy baggage across long distance, mostly uphill. The room is spacious. Water is hot enough for bathing in cold weather. Owner is helpful although it can be hard to find him at the hostel sometimes. It provide bicycle rental n free flow of coffee. Breakfast hv to cook myself. But at this price, I can't complain.